The Dry Tortugas have always had a reputation for some of the best birding; and this week, it was proven again. 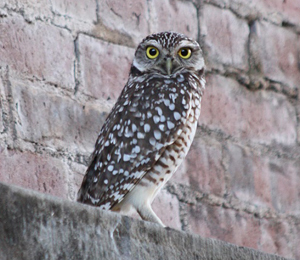 Our bird watchers spotted a burrowing owl perched in the grass at Fort Jefferson. This species is known for its quirky behavior and lifestyle, and this particular owl was making a sort of timorous chattering or chuckling call. It also started bobbing its head. This is a way the burrowing owl expresses its excitement or distress. You can imagine the thrill of watching this little guy. Well, after just a few minutes, it grew tired of being stared at and flew off around the walls of the fort. It should be no surprise that this cute burrowing owl was named our favorite bird of the week. Burrowing owls live year round in the Caribbean as well as in South Florida. The breeding owls from the Northern United States and Canada migrate in winter to South Florida and Mexico. These burrowing owls are known to live nine to ten years. They are pint-size and enjoy the open, treeless areas. Being one of Florida's smallest owls, averaging only nine inches in height and having a wingspan of about 21 inches, this species spends most of its time on the ground, mainly because its sandy-brown plumage gives a camouflage appearance to keep away potential predators. The burrowing owl lacks the ear tufts of the more common woodland owls. A white chin and bright yellow eyes accent the face. This owl also has uncommonly long legs providing added height for a greater view from its usually ground-level perch. Florida burrowing owls can be found throughout the state depending upon their habitat. New habitats have been created by humans through draining wetlands and clearing forests. This owl generally prefers cleared areas that provide short ground cover, such as golf courses, agricultural fields, pastures, and vacant lots in residential areas. Historically, the burrowing owl occupied the prairies of central Florida. These guys live in loose colonies comprised of two or more families or sometimes just as single breeding pairs. Burrowing owls, unlike most owls, are very active during both the day and night. Mostly during the day, you can see them standing erect on a nearby post or at the mouth of the burrow. While in flight, the burrowing owl undulates as if flying an obstacle course invisibly. They can also hover in midair, which has been seen as a technique for capturing food. Normally, they eat insects, particularly beetles and grasshoppers, but other important foods are snakes, frogs, small lizards, birds, and rodents. While nesting generally occurs from October through May, the eggs are primarily laid in March. Over a one-week period, the female lays six to eight eggs and will incubate them for 21 to 28 days. The young owls are covered with white downy feathers at hatching and have their eyes closed. They will remain with their parents until around 12 weeks old. The Fort Jefferson ferry runs daily to the Dry Tortugas National Park bringing folks for the absolute best snorkeling in Florida. But, a lot of folks are not aware of the absolute best bird watching in Florida. More and more bird and nature enthusiasts are becoming aware from all corners of the world. Catch the ferry and come out for a fun-filled day or two of some exciting birding.